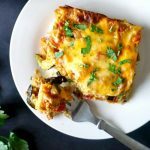 Greek Moussaka Recipe with Potatoes, Eggplant and Turkey topped with a creamy bechamel sauce, a complete dinner recipe that gives comfort food a new meaning. Hearty, big on flavours, and so yummy. If you are looking for a hearty meal that is healthy and delicious at the same time, then you got to try this super easy moussaka. 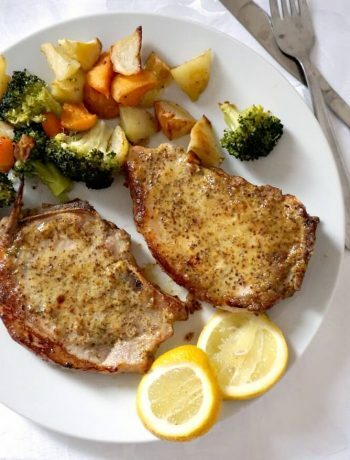 The Greek cuisine is well knows for making wide use of fresh seasonal vegetables, olive oil, good fish and meat and all sorts of fruits and nuts. It is said that the Greek diet is by far one of the healthiest diets in the world, and rightly so. If you are looking for healthy food ideas, the Greek cuisine is the place to start looking. Now, we love moussaka in Romania too. Our cuisine has evolved and absorbed numerous influences over the years, and so we enjoy a wide range of dishes that we even adopted as national dishes. So, what’s the fuss with this Greek moussaka? Well, it’s got layers of healthy baked veggies, lean ground turkey, and a creamy bechamel sauce. Pretty amazing, isn’t it? How do you make easy moussaka? It might not be a quick recipe that I usually blog about, but it’s certainly dead easy to make, and worth every single second you spend preparing it. And it’s healthy too, since all the veggies are baked, rather than deep fried. 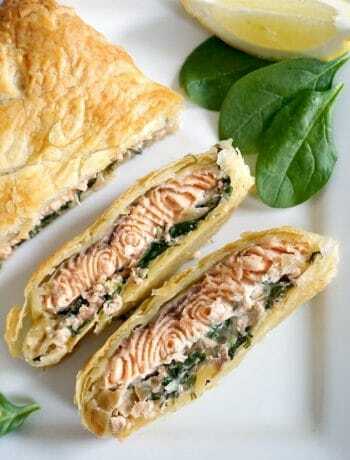 The secret is to bake the vegetables separately, so that you can easily create perfect layers. The turkey mince is all cooked separately, then arranged nicely between layers of baked vegetables, then topped with a beautiful bechamel sauce. 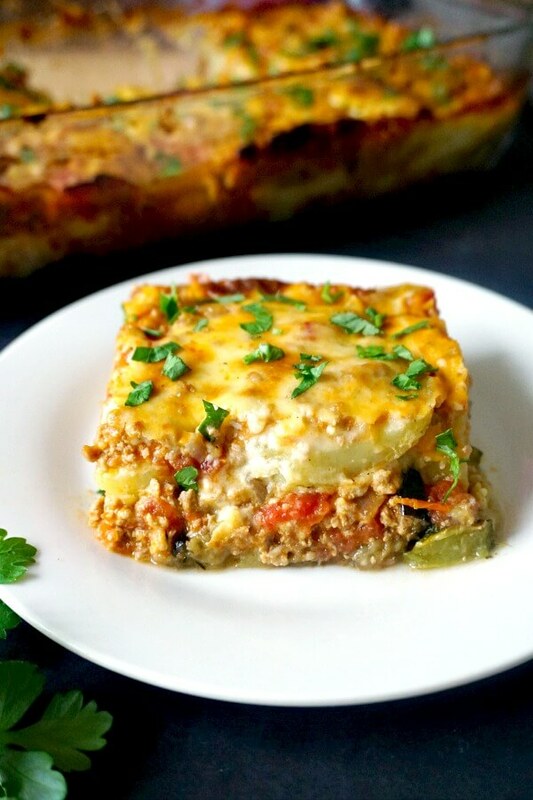 What dishes are similar to the Greek moussaka recipe with potatoes? 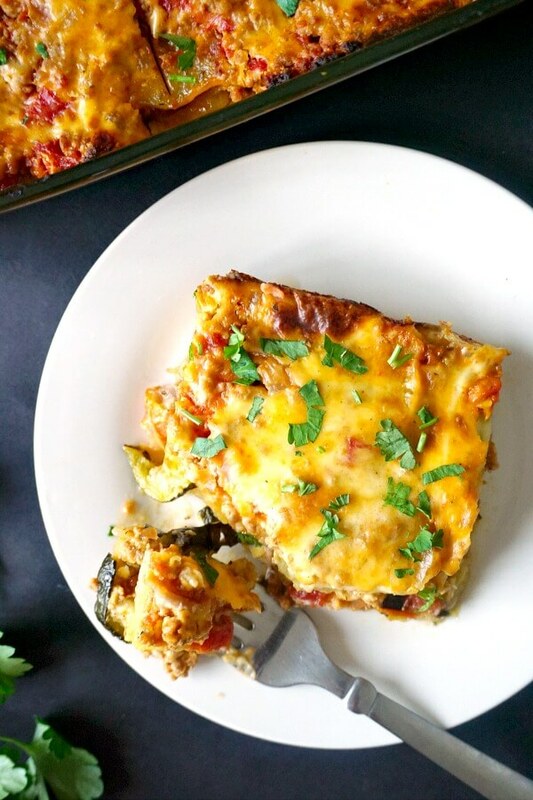 If I am to compare the traditional Greek moussaka to other dishes, I would first think of cottage or shepherd’s pie, or even the Italian lasagna, if you replace the lasagna sheets and go for a low carb lasagna with zucchini. The moussaka is richer in flavours though, since you’ve got more choice of veggies, and make plenty of use of olive oil. One herb that is a complete game changer is thyme, either fresh or dried, so do use it as you like. 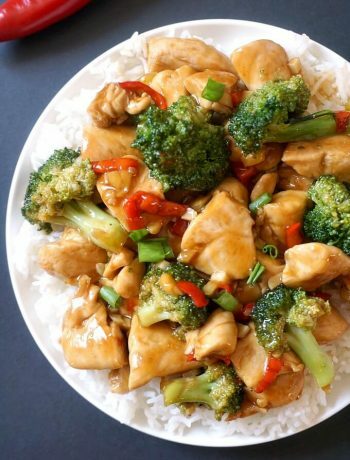 One dish after my own heart, that’s for sure! If you’ve liked my EASY GREEK MOUSSAKA RECIPE WITH POTATOES, EGGPLANT AND TURKEY or any other recipe on the blog then don’t forget to rate the recipe and let me know how you got on in the comments below, I love hearing from you! You can also FOLLOW ME on INSTAGRAM, FACEBOOK, and PINTEREST to see more delicious food and what I’m getting up to. Easy Greek Moussaka with Ground Turkey, Eggplant (Aubergines) and Potatoes topped with a creamy bechamel sauce, a complete dinner recipe that gives comfort food a new meaning. Hearty, big on flavours, and so yummy. Preheat the oven to 200 degrees Celsius (390 Fahrenheit). Slice the eggplant, drizzle a bit of olive oil over, add a pinch of salt and thyme, and arrange on a baking tray. Bake for about 15 minutes, until the eggplant slices begin to soften, then slice the zucchini, and again drizzle over some olive oil and season with salt and thyme. 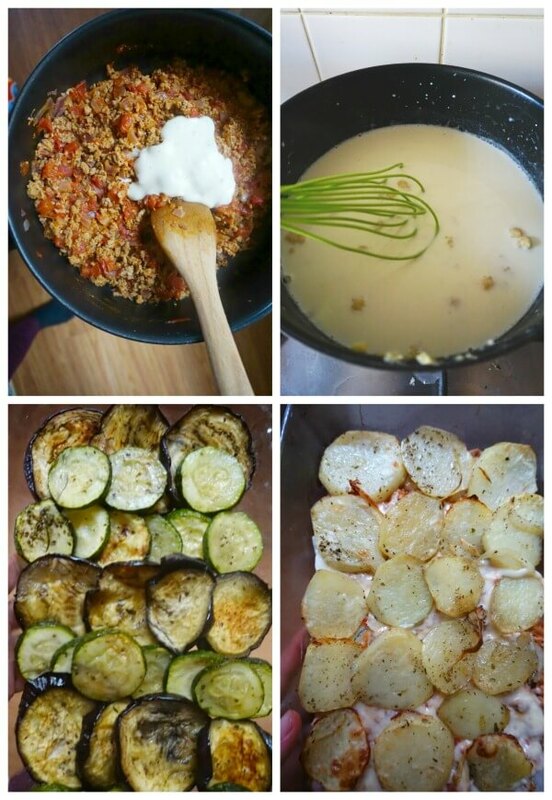 Add the zucchini over the eggplant, and bake for a further 10-15 minutes. Once they eggplant and zucchini have softened, remove from the tray, slice the potatoes and one of the onions, and repeat the process, baking them for about 20 minutes. Meanwhile, chop the other onion, and heat up one teaspoon of oil in a pan. Add the ground turkey, and cook until the meat is no longer pink, then add the chopped tomatoes and the broth, and cook until the liquid has been absorbed. To make the bechamel sauce, melt the butter in a pan, add the flour and whisk well. When the sauce has thickened slightly, add the cheddar, parmesan cheese, salt, pepper and nutmeg and remove from the heat. Add one tablespoon of sauce in the turkey mixture. To assemble the moussaka, grease an oven-proof dish with olive oil, add one layer or the baked eggplant and zucchini, one layer of the cooked turkey, one layer of potatoes and onion, another layer of turkey, then top with the bechamel sauce. Bake in the oven for about 15-20 minutes until the top is golden. Garnish with chopped parsley (optional).